LET THERE BE LIGHTS! Aesthetic lighting like this on the Phoenix Park bridge will be park of the new pedestrian bridge that will be built this summer connecting Phoenix Park to Haymarket Plaza. 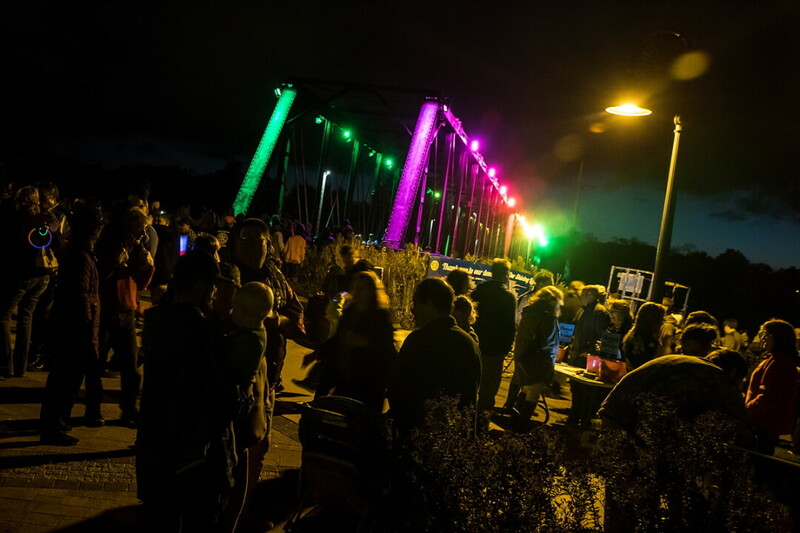 The soon-to-be built pedestrian bridge that will span the Eau Claire River in downtown Eau Claire will be illuminated with the same high-tech lighting as the nearby Phoenix Park bridge thanks to a donation from an Eau Claire entrepreneur. Zach Halmstad, co-founder of software firm Jamf and a major downtown investor, will give $110,000 to install aesthetic lighting on the bridge that will connect Phoenix Park and Haymarket Plaza. The Eau Claire City Council voted May 22 to accept the donation. The donation will also allow aesthetic lighting to be installed on the nearby Grand Avenue pedestrian bridge, which is being refurbished this summer. (The city had originally intended to pay for lights on the new bridge, but now it will spend those funds to light up the Grand Avenue bridge instead.) The Phoenix-Haymarket bridge is expected to be completed by this fall in time to carry pedestrians to the newly built Haymarket Plaza in front of the Pablo Center at the Confluence. Once all the projects are completed, programmable LED lights will illuminate three bridges downtown, creating a unique swath of color through the heart of the city.